It is easy to understand why using modular construction on projects carries some appeal. The commonly held view is that by moving construction labor activities to fabrication yards rather than performing them at the project site, capital project performance outcomes can be improved in terms of worker safety and cost and schedule effectiveness. Modular construction allows owner companies to work around the challenges associated with the lack of skilled construction labor in some locations. Constraints and dangers associated with executing expansion and upgrade projects at an operating plant can be by and large remedied when a large percentage of fabrication work is performed off site. Also, construction can begin as scheduled if work or environmental permits required at the project site are delayed. For these reasons and others, it is not surprising to find that, in recent years, modular construction designs have been on the rise. In 2014, 57 percent of projects over US$15 million used a modular approach on some scope. But, despite the potential benefits of modular construction, IPA research shows that modular construction is not necessarily more efficient in terms of cost or schedule. Figure 1, above, shows reduced hours per million dollars for projects classified as being highly modular. However, this does not necessarily translate into faster schedule or lower cost. IPA conducted a study examining approximately 800 projects that used modular construction. For the study, modular construction includes modules, skids, and pre-assembled units designed and fabricated as separate components that could have reasonably been constructed in a non-modular fashion, if desired. The performance of the modular projects was then compared with the performance of more traditional stick-built approaches, in which most construction happens at the project site. Perhaps unsurprisingly, nearly half of the modular projects’ project teams said they chose the modular approach as a means of improving labor productivity by moving construction to a shop (49 percent). Project teams also cited the ability to duplicate multiple installations of similar design at the fabrication yard as a means of cost containment (32 percent). Other reasons they gave included alleviating local labor availability issues (29 percent) and overcoming congested site conditions (29 percent). Several project teams also cited improved worker safety as a reason for choosing a modular approach. However, IPA determined that the challenges, risks, and added costs of modularization are not always recognized. Figure 2 & 3, above, illustrate minimal cost and scheudle competitiveness differences between modular and non-modular projects. The study found that using modular construction versus a stick-built approach may not achieve the objectives of improved cost, schedule, and/or safety. 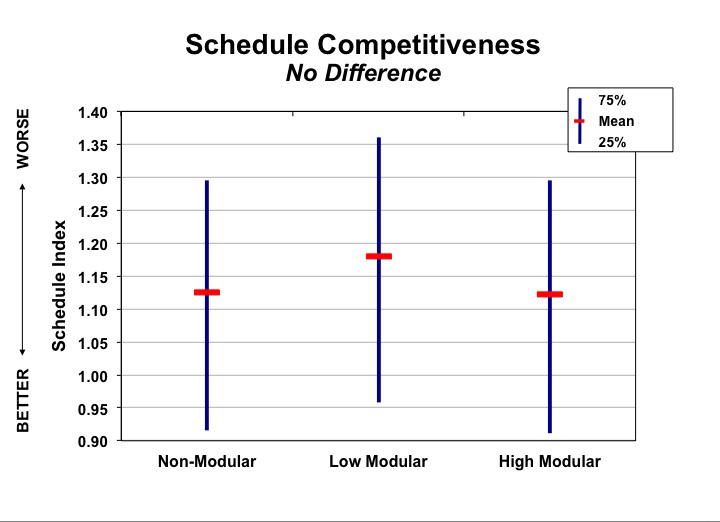 As expected, modular construction lowers construction hours in the field, which may be beneficial to projects where site congestion or labor availability is an issue. 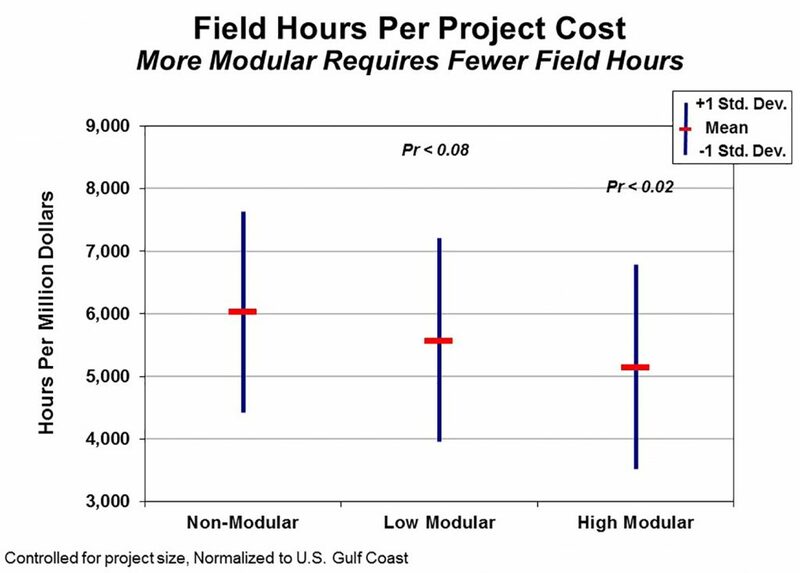 Figure 1 shows reduced hours per million dollars for projects classified as being modular. However, as shown in Figure 2 and Figure 3, the average execution duration and cost effectiveness of modular projects is not better than stick-built projects. Moreover, the variance in these outcomes is very large. To identify what practices drive the variance in outcomes for modular projects, IPA identified a group of projects with the Best performance. The best modular projects were selected based on their cost and schedule predictability, -5 percent to +10 percent cost deviation and a ±10 percent schedule deviation. 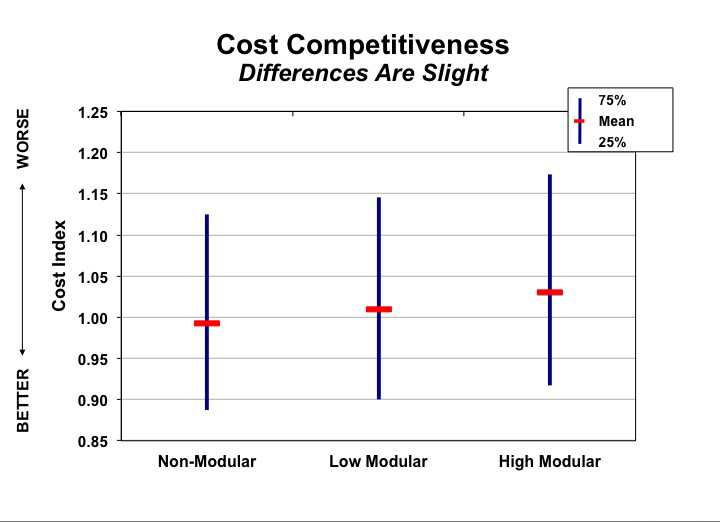 As noted, the average performance outcomes (cost, schedule, and safety) for modular construction projects are essentially the same as when using a non-modular approach. In studying the variance in performance, an important finding is that, to be successful, modular projects require significantly better project practices, particularly with respect to Project Execution Planning. The decision whether or not to employ modular construction and the extent to which modules will be used must be made very early in front-end development, before front-end engineering design (FEED). The Best projects chose the modular strategy when engineering was less than 7 percent complete and had consistently better measures of Front-End Loading (FEL) at authorization. The Best projects also used Constructability Reviews more often and implemented better project controls. In addition, a strict controls plan is necessary on modular projects to control the activities in the fabrication yard. For instance, with a control plan in place, if a module experiences changes during production, work forces may be pulled from production and shifted to other projects that could have a significant effect on the module’s delivery schedule. The best performing modular projects had considerably better control plans and practices. IPA is considering research to quantify trade-offs between modular and stick-build construction strategies by identifying characteristics of modular projects that drive the risks associated with them. We will also identify Best Practices that effectively eliminate or minimize these risks. Study participants will benefit from a decision-making process for when and to what extent they should use modular construction. Participants will also better understand the risks they take on with modularization and become familiar with Best Practices to ensure effective delivery of their modular projects.